What beautiful images of this bizarre and wondrous moon. A fitting farewell to Hyperion from Cassini! Awesome closeup of Helene. A strange, yet beautiful small moon. Just a beautiful convergence of very diverse moons. Thanks Cassini!!!! It's almost like a cosmic ballet dance between these two small ringmoons. Fantastic images. Hope to see more of these two moons in the future. 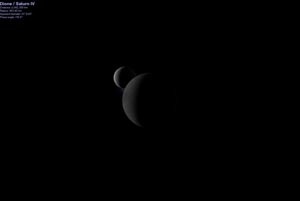 Lovely shot of Titan and Dione.Cassini shows us the dazzling variety of worlds that inhabit the Saturnian system. Very nice detailed images of the waves and Daphnis.Andrew is right, it is nice to see Daphnis other than an undistinguishable point of light.Awesome!!! "Thats's no moon, its a space station!!!!" Maybe we will someday and personally enjoy these fantastic sights. This unique view from Cassini makes me think I am right along the spacecraft watching these fantastic plumes. I wonder by studying the faults and fissures on Enceladus, could we learn more about the behavior of mid-ocean ridges and plate boundaries on our own planet? This has to be one of the best closeup shots of Janus to date. Loved the movie. The scene with the Enterprise emerging out of Titan in full view of the majestic rings was awesome. You do deserve a cameo in a potential Star Trek sequel. This is one of my all time favorite Cassini images. Get two moons for the price of one.Just shows the wonderful variety of worlds surrounding Saturn. What a spectacular sight. No artist on Earth can come close to replicating such natural beauty as the Saturnian system.